Thanks! It installed fine and is far better for functional purposes. I haven't been able to see any problems with it. It even still works as well as with prior versions with an Aero Glass prototype (thanks again for the "Disable Taskbar Transparency" setting). People are really going to want this once they figure out the search in Windows 10 start menu is a bad joke and the search doesn't target things on their computer. They'll realize Cortana is just stupid after a few minutes. There is an option in Windows 10's Folder Options to switch back to "This PC" from "Quick Access". Agree. I have earlier and later builds of Windows 10 and seem to work well in both the 32 bit and 64 bit versions. IF I want Cortana for search, it seems rather moot since Google or Bing will give me more precise control and I can then "tab" into the results to see what I may want to look at. Yeah, I'm seeing the same. You get the same error when you look for those apps in the search screen, so the problem is not related to Classic Shell. Do you have a Microsoft account or a local account? Possibly that app requires a Microsoft account to get its information from it. Thanks GauravK worked like a charm! 'Search' remains the odd out, doesn't have an (Error) next to it, but the app appears to want you to create a system level Microsoft account (something I'm loath to do). Well about that Explorer folder tree corruption issue with the Navigation pane style set to "Windows XP Classic" I observed that if you set the "tree item spacing" to 4 or higher, the icons don't get corrupted even in 'Windows XP Classic' style. But it's not a true solution. According to Ivo, "It is something that can't be depended on. The metrics in the tree depend on many external factors – DPI, text size, icon size. The root cause of the problem is that for some reason Windows 10 sets the line height to be 8 pixels and then uses 3 lines to represent each item. In that mode the tree control can’t correctly draw the icon, so Explorer draws it manually. However that interferes with the way the control draws its lines." In Windows 10 build 10061 with Classic Shell 4.2.1, the Metro Apps do not show up. If I choose to show them in the menu as a list, it says the list is empty and shows nothing. In All Programs, opening the Apps folder also shows nothing. Yes in this build it is broken. Windows 10 is changing and something about Classic Shell constantly keeps breaking. Once Windows 10 is finalized, proper testing will be done with Classic Shell and whatever is broken will be fixed. Version 4.2.1 is compatible with Windows 10 (at least the pre 10061 builds) and won't be removed by the installer. 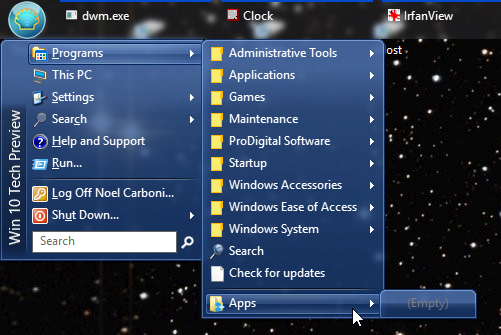 For build 10061 people report problems seeing the apps and problems opening the Win+X menu and the Windows start menu. Removing and re-adding Apps to the menu structure didn't refresh the list. 10061 seems like a pretty buggy release. On my last use of Classic Shell I had a shortcut that enabled me to see and use the Windows 10 pre start menu. this shortcut is missing on build 10061. any ideas on how to get it back. I would like to play with the Win10 menu and see if I can learn how to make it usable. Windows 10 10061 is not supported. Classic Shell will be updated for future Windows 10 builds after it reaches a more stable state such as RC or RTM. OK thanks, it did work on the previous builds and I did enjoy using it. I have the same problem. I would be grateful for a fix. Thank you. I will look forward to it and I can understand you not wanting to follow all of Microsoft's W10 changes. What I really want to see into you're new version is a possiblity to work with Microsoft Windows 10 with a new HotKey. Shift Button + Start Button = Start Menu Metro Microsoft Windows 8.1, like before. Start Button = Microsoft Windows 7 Start Button, like before. Ctrl + Start = Microsoft Windows 10 Original Start Button, New Button. Can you please add a Function to change the Keys to the Keys you like? Also I really love to see that you can change the option when you click with you're left mouse button onto the Start Button. 1. Start Menu Metro Microsoft Windows 8.1. 2. Microsoft Windows 7 Start Button. 3. Microsoft Windows 10 Start Button, New Option. Post subject: Re: Microsoft Windows 10 StartMenu Question - Add KeyButton? The windows 10 UI has a fullscreen, and a start menu variant correct? because Im fairly certain Ivo wont be re-implementing the windows 8.1 start screen in windows 10 if its not already present. Keyboard & Mouse Click: Shift Button + Start Button or Left Mouse Click on Start = Start Menu Metro (Start Screen Renamed from Metro) from Microsoft Windows 10, like before (Example was Microsoft Windows 8.1). Keyboard & Mouse Click: Start Button or Left Mouse Click on Start = Microsoft Windows 7 Start Button, like before. NEW: Keyboard & Mouse Click: Ctrl + Start Button or Left Mouse Click on Start = Microsoft Windows 10 Original Start Button, New Button. Can you please add this into you're new version? Classic Shell only implemented the Classic Start Menu from Windows 7 and earlier. Adding the Windows 8.1 Start screen to Windows 10 or the Windows 10 Start Menu to Windows 8.1 is not a trivial job and there is no point in having 3 launchers, so no such plans. That said, I do agree that some functionality of the 8.1 Start screen is lost in Windows 10. It's typical Microsoft behavior - add 1 or 2 features, remove or break 10 other features. I think the Windows 10 start menu is getting there. If Windows 8 had what Windows 10 has (start menu) wise, people would have been happier. The only problem I see is that it lacks a full screen applications list. In time that may come, they seem eager to change things, for good and bad (look at the new volume adjust GUI in the insider preview). I was running CS 4.2.0 on Windows 10 Build 10041 on VirtualBox 4.3.24 and all was well. and middle clicks did nothing. I attached the CS config file. I have no idea if this is actually a CS issue and really don't care about the issue in my VirtualBox installation, but thought I'd report it for the record just in case it might be a real issue. FYI, 10074 has the same problem. When you speak of corruption, could that be related to the visual noise that seems to be there in Windows Vista mode when the buttons are fading-in/out? I disabled the fade-out and things look better. Possible bug - I am on Win 10 build 10074 and just upgraded to CS 4.2.1. During the install it removed the StartScreen button from my taskbar, I have since put it back but it does not work anymore. Also the Icon is not the same as what is in the Start Menu of CP and StartScreen (togglenew) does not work from Start Menu either. I believe that this version of CP listed a fix for StartScreen (togglenew), not sure what happened. Classic Shell will support Windows 10 once it reaches a stable state. Right now there are so many builds coming out and something is breaking frequently. I had to pin media player to the list. not the usual windows 7 layout above the other etc windows programs like installing to windows 8 did. But clicking the "Apps" button does not work including the "Start Screen" doesn't work either. I've checked the option in settings but nothing happens. Only when closing down Classic Shell win+x menu works. But not when having Classic Shell running. On my win8 system it works just perfect. For now there's not much point making changes in classic shell, only to have a new windows update break them again. This build seems a bit buggy. anyone upgrading to Windows 10? how does it work for x64 users and accessing higher RAM? and what limitations does it have over Windows 7 Ultimate? its pretty sketchy.. all the specs and details pages in the windows 10 page led me to dead links and pages that cant be found.. Build 10130 has the same problem. So for the next 30 days I'm using the Start10 trial version. I'll go back to Classic Shell after that if it works with 10. I've been using it with 8.1 since shortly after Windows 8 came out. I may put the 7/29 version of 10 on one of my test desktops, but since we've got a year to get the free upgrade, I'm going to wait and see what happens. They say we can still stay with the Insider Preview, so I'll probably do that for a while. There've been so many changes to the user interface in 10, I've got a feeling that business users will be loath to make the switch. In an earlier post somebody asked about what was left out of Windows 10. MS has said the Media Center will not be in 10 when it ships 7/29/15. I'm using 4.2.1 on Windows 10 build 10130 on a virtual machine. Win+X and Win both work for me with Classic Shell running. However, what's missing in 10 is that the Apps menu is empty, which is isn't in 8.1. I'm signed in to a local account on both, not a Microsoft account. If you right click the Classic Shell start button you get a Classic Shell menu as always. Can someone please provide this skin for me? I really like this skin but I can't find it anywehre. It's not a skin. It's the Windows 10 Start Menu shown off by Microsoft in one of the earliest builds which changed substantially in later builds. ooohh, i see. kk, ty. On W10 latest build no. 10162 the Classic Shell Start Menu and Explorer settings are all working OK for me but the CS Start Menu resets back to the new style W10 start menu with tiles on every reboot. I have got around this by placing a shortcut on desktop to "ClassicStartMenu.exe" and on reboot I click on this to get the Classic Shell Menu and button back again. Hope this problem won't be permanent when W10 is officially released? What are the experiences of others here trying out W10 with the latest builds? If you upgraded Windows in place from older build to 10162, it is possible Classic Shell got deactivated. Uninstall it and then install it again. Let me know if that fixes the problem. Thank you Ivo, will try that today and let you know later. Many thanks for your help, I re-installed program and the problem is fixed. Donation on it's way to you via paypal as I could not compute without this wonderful program! !